The 11th season of Indian Premier Leauge (IPL) has been started and all the overseas players have made their comeback to their franchise teams. In one of them is Aaron Finch who joined Kings XI Punjab for the IPL tournament. Recently Finch shared some pictures of her wife with him on Instagram. Finch posted the picture and captioned it, "What a day! Our wedding was everything we’d imagined and more! Wouldn’t have been possible without the following bunch of incredible people, thank you for making Amy Finch and my day as special as it was!" This is to notice that Aaron Finch is Kings XI Punjab's opening batsman who belongs to the Austrailian team. These days while he is in Mohali, Punjab missing his wife and sharing her pictures. Finch just shared these pictures a few hours ago and now people have started wishing him. 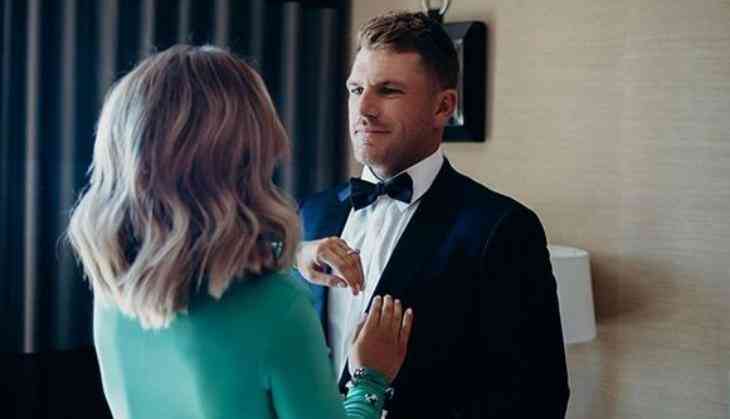 Aaron Finch couldn't be able to play the first match due to his marriage and that time he was missing his team, he even posted a post. In one of the picture, Finch posted the nameplates of Amy and Aaron from their marriage. Also Read - IPL 2018, KXIP vs RCB: Will Kohli's men be able to register their first win of the tournament! A huge thank you to @thestilelist @biancavirtue & @jasongrech for making the #ABMedal a breeze for @amy_griffiths and I to get ready for!! Aaron and his wife are together with each other for a long time and in April month he started getting together with her for a lifetime.